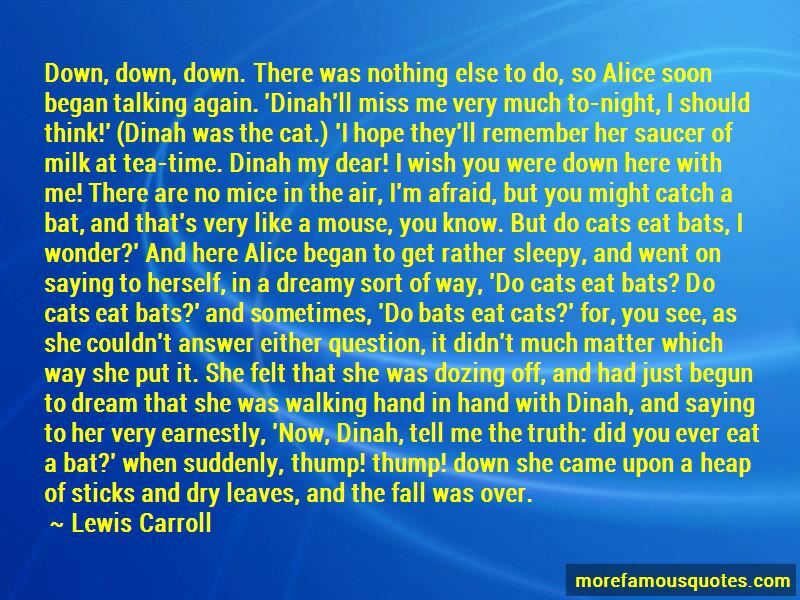 Enjoy reading and share 48 famous quotes about Catch A Dream with everyone. “Gilly had decided that this was a dream. The Witches' Carnival didn't exist in the real world. And the Gilly who existed in the real world was not brave or cunning enough to have done everything that she'd done in the past day. The real Gilly was not beautiful enough to be lying in bed beside a woman like Maggie. Gilly had decided this was a dream, and also that she'd let that real Gilly, deep asleep somewhere in the outskirts of Birmingham, wither away and never wake up. “He wondered where his mind had wandered this time, what life it had lived as a trail of neurons sped through networks of possibilities particle-fast, too rapid to catch without a hadron collider, causing super quarks of weirdness and leaving him with only a vague after-image like a melting dream. He had to accept that he couldn't catch all his thoughts, all the things going on in his body, the processes which slipped by in the background just leaving a shadow, an itch, the grain of sand that probably wouldn't become a pearl, a blazing after-trace that lives a second then is gone forever. All those possibilities occurring in a second of frantic life: it never ceased to amaze him. The world was an incredible and beautifully constructed thing. Yes, if you can dare to dream. Surely you can catch the sunlight's beam. While all else seems to fail. “I let myself feel good for no reason. I let joy happen right there and then, and it's inside me and around me, it's the lights on the road ahead, the clean black of the night, the cold air coming through the window. It's like hearing a song for the first time and being struck by it, haunted by it, wanting to hunt it down and catch it, because the song sums up something you didn't know you wanted to say, giving you chills and goose bumps. But even as you find out what it's called, and you're thinking you'll download it, you've already lost. Because the feeling was right then and there and it's already fading like a dream. “My eyelids are heavy as stone. But when I sleep, I'll have that dream again. I haven't wanted to tell you about it, until now. I'll be in the Separates, and I'll be digging with my bare hands. When I've made a hole deep enough to plant a tree, I'll place my fingers inside. I'll slip off the ring you gave me. It will catch the light and glint a rainbow of colors over my skin, but I will take my hands away, leaving it there. I'll sprinkle the earth back over it, and I will bury it. Back where it belongs. I'll rest against a tree's rough trunk. The sun will be setting, it's dazzling color threading through the sky, making my cheeks warm. Then I will wake up. 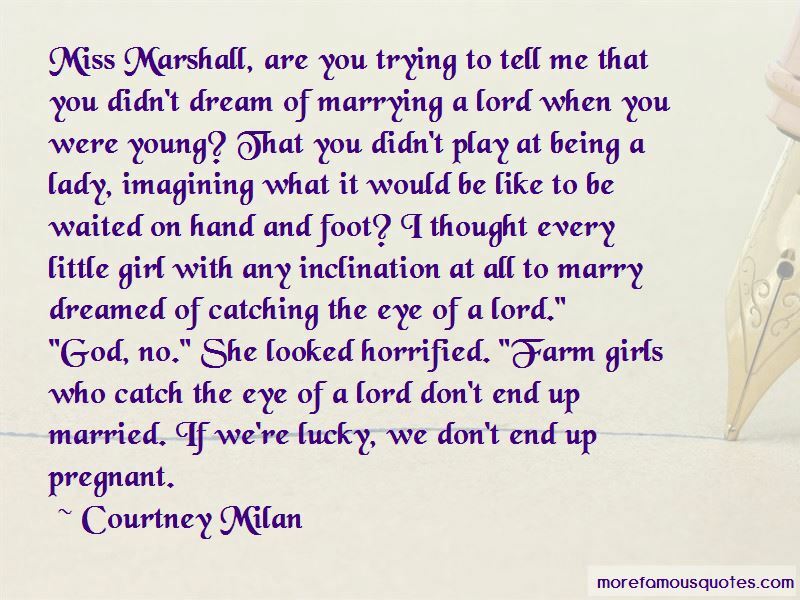 “Miss Marshall, are you trying to tell me that you didn't dream of marrying a lord when you were young? That you didn't play at being a lady, imagining what it would be like to be waited on hand and foot? I thought every little girl with any inclination at all to marry dreamed of catching the eye of a lord." “Holding his daughter close with one arm, he pointed toward the distant horizon. "As far as you can see-it all belongs to you, Faith. Someday, I'll take you to the top of a windmill and teach you to dream. When you reach for some of those dreams, you might fall ... but your mother and I will be there to catch you because that's what love means: always being there. I love you, little girl." He pressed a kiss to his daughter's cheek. "So much ... it hurts. But I reckon that's part of love, too." I bite back the moan caught in my throat just before he lifts me up and carries me to the bed. He's on top of me in an instant, kissing me with a kind of intensity that makes me wonder why I haven't died or caught on fire or woken up from this dream yet. He's running his hands down my body only to bring them back up to my face and he kisses me once, twice, and his teeth catch my bottom lip for just a second and I'm clinging to him, wrapping my arms around his neck and running my hands through his hair and pulling him into me. “But nothing was said about chicken farming anymore. Once, long after it was too late for farming, he might catch her crying and pet her a bit. 'What's the matter, little baby? You got a fever? You want to take the night off?' She might murmur something about candling eggs, but he wouldn't be able to understand what she meant. And after a while she cried on without knowing what she meant either, as a girl cries over a bad dream long after the dream is forgotten. “[ ... ] she heard Stefan's voice. "Elena! Let go! Fall and I'll catch you!" Shaken out of her dream, Elena looked below her. And there was Damon, standing protectively in front of Meredith, looking up at her, with his arms held out. 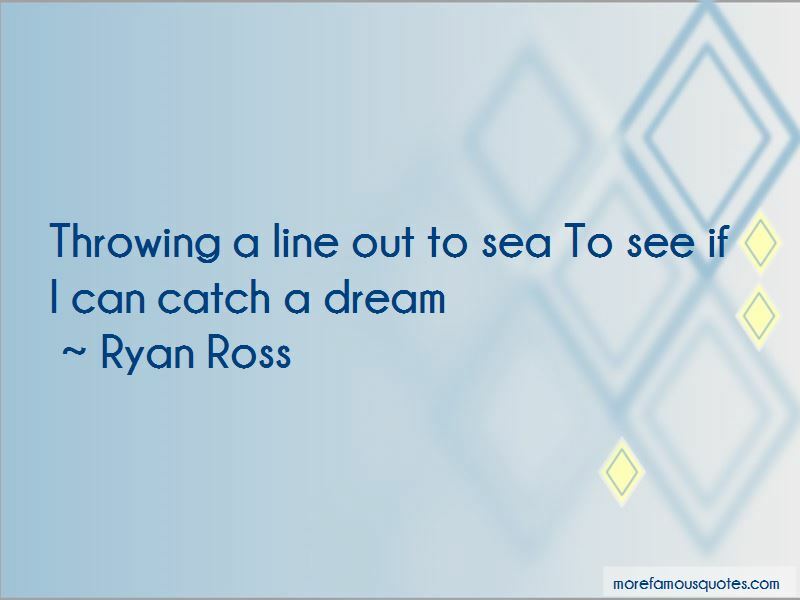 Want to see more pictures of Catch A Dream quotes? 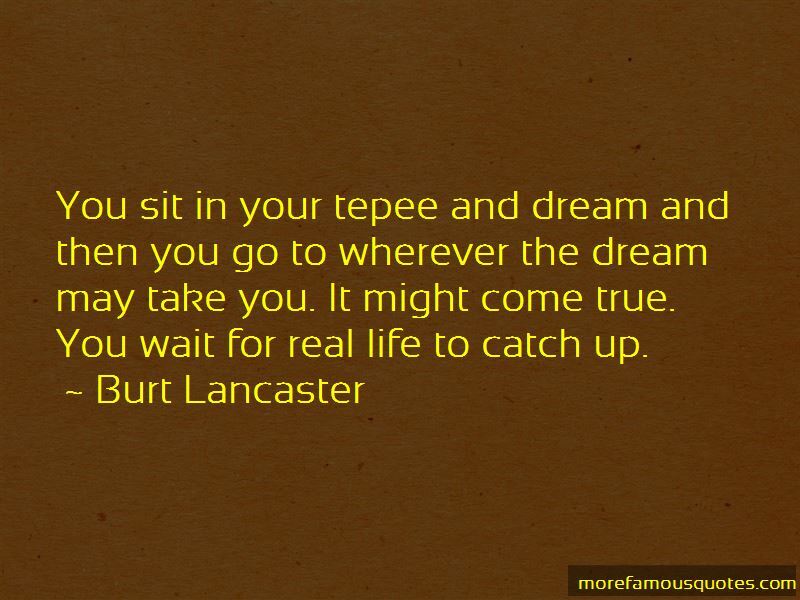 Click on image of Catch A Dream quotes to view full size.